Sometimes you have to gamble. Sometimes you have to deny that you’re at a dead-end in life and push through. Sometimes you know you’re good at something and just want people to recognize it, and maybe pay you for it, too. In June of last year, I got an e-mail from someone calling himself Robin Graves. He said we’d just met; we’d played Smash Bros. together during an E3 demo. He was the one who worked for Nintendo. Robin, whose real name is actually Erik Swanson, went on to tell me that he dabbled in “recycled art”—crafts made out of trashed and repurposed objects. His most recent creation was a hot-pink Barbie Corvette that he’d ripped apart and transformed into a working N64. I thought it was cool, so I shared it on Kotaku, honoring his request that we leave out his real name. Months later, Swanson sent me a long confession: this was actually just one step of a master plan he’d put together not long before we met. 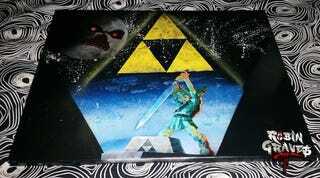 His goal wasn’t just to show off a cool piece of art he’d created—it was to get the attention of Nintendo’s highest executives including Nintendo of America president Reggie Fils-Aime. Swanson wanted them to know that he’s miserable there—and he wanted to persuade them to let him funnel his artistic passion into a new job. With my help. Impressive fan-made creations are not uncommon, and we spend a lot of time highlighting the creative accomplishments of gamers at Kotaku, as we did with the Corvette. But this is an unusual—and fascinating—case: here’s a guy who makes creative art and contraptions themed around Nintendo… and he also works at Nintendo. Yet he can’t stand it. For this fan, even getting a foot in the door wasn’t enough. See, Swanson isn’t translating Zelda puzzles or helping Shigeru Miyamoto make the next Star Fox game—he works in a warehouse 30 minutes away from Nintendo of America’s main campus, where he does distribution, helping ship 3DS systems and amiibos across the United States and Canada. Swanson’s job is to coordinate training for the many throngs of temp workers who come into Nintendo’s warehouse on any given week. He says it’s “very strategic”—and he says he hates it there, as much as he enjoys the occasional field trip to work the booths at PAX or E3. He wants something more creative. “I’ve been miserable for a long time,” Swanson said in an e-mail. He’s worked at NOA for close to a decade now, and he says he’s applied to a lot of other jobs within the company, to no avail. Meanwhile, Swanson has spent the past few months working on various crafts, ranging from Nintendo-themed spray paintings (like the Zelda art above) to elaborate machines like the N64 Corvette, which he made as a birthday present for his sister. Swanson said he’d always planned on trying to get the Corvette on Kotaku, but when he met us at E3 last year, he decided he’d just ask me directly. “I was at E3 and realized I was playing Smash Bros. with you so I tried the very direct approach,” Swanson said. At first I was a little pissed, as any reporter would be when presented with a subject who’s trying to manipulate them. But it was hard not to empathize. Swanson comes across like a talented, passionate, eccentric artist who’s looking to turn his creative outlet into a career—except unlike most hobbyist artists, he already works for Nintendo. He just can’t find a way out of the warehouse. Rad, right? Swanson said he made it for the one and only Reggie Fils-Aime. He’d sent an e-mail to Fils-Aime on his Robin Graves account with a link to the video, but got no response, so he’s hoping the veteran Nintendo exec reads Kotaku. “With any luck he’ll take it and display it in his office,” Swanson said. Once the cigar lighter is safe and sound on Reggie’s desk, Swanson will advance to step three: building a Zelda monstrosity that he hopes will get the attention of every Nintendo geek out there. As we were talking for this story, I asked Swanson if he was concerned at all that Nintendo would punish or even fire him for going public—after all, big game companies don’t like it when their employees speak to the press. It’s easy to imagine finding oneself in a similarly desperate situation, where even the dreamiest of dream jobs feels more like a trap than a fantasy. Sometimes, you’ve just gotta go for broke.